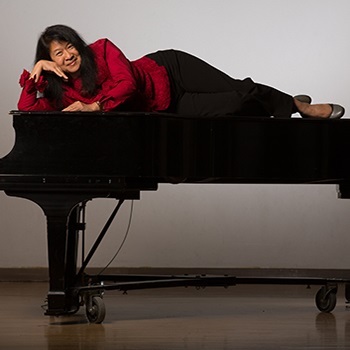 Pianist Paula Fan has performed on five continents, recorded twenty commercial albums, and has broadcast for the BBC, NPR, Radio Television China, and international stations from Bosnia to Australia. As one of the first recipients of the doctorate in Collaborative Piano, she has lectured on the subject worldwide. She performed and taught at the University of Arizona Fred Fox School of Music for 40 years, has played with the Tucson Symphony for 31, and has also served as Visiting Professor at the Eastman School of Music. As both performer and teacher, one of her greatest interests has been building bridges between classical music and audiences of all ages and backgrounds, as well as between disciplines. The daughter of highly indulgent non-traditional Chinese parents, Paula started her career in higher education by writing a show, “Opera is…” which in 9 months introduced over 1000 children to opera using paper hats, hammy melodrama, and original English lyrics to traditional arias. Throughout her academic career, she has explored the world of classical music in different ways with her series of “Time Traveler’s Concerts” in which musicians from history speak as well as perform, “Accompanist’s Lib” concerts highlighting the role of the underappreciated assisting pianist, and in collaborations with other entities, most notably the Arizona Research Institute for Solar Energy, AzRISE. She was a founder of the Solar Storytellers–a piano trio playing electric instruments powered by a golf cart with a solar panel for a roof–and with her brother Michael, produced the Dr. Solara Trilogy of children’s solar energy shows performed on the National Mall in Washington DC, at the Aspen Science Center, and in Tucson. As the only Regents’ Professor from the Fine Arts, Paula was part of the team that founded the University of Arizona’s Confluencenter for Creative Inquiry, which not only brings together traditionally complementary disciplines within the Humanities and Fine Arts, but also, recognizing that creativity exists within a context, is unique in its inclusion of the Social and Behavioral Sciences and beyond. With Confluencenter’s encouragement, Paula’s Creative Collaborations series has married disciplines from Hospice Care to Cookery with so-called “serious” music, based on her belief that classical music belongs to everyone. She is now Confluencenter’s first Senior Fellow, and continues to perform throughout the world.